The term 'walking away from the property' usually refers to owners who leave a home when they can't make the mortgage payments. In Youngstown, Ohio, it may gain a new meaning: to describe banks that abandon a vacant property in foreclosure, and leave neighbors to cope with the blight. Now banks that walk away from their properties are being reigned in by a local community organization. This year, thanks to the efforts of the Mahoning Valley Organizing Collaborative (MVOC), Youngstown, Ohio became the first city in the nation to require banks to pay a $10,000 cash bond to the city when a house is both vacant and foreclosed. As a result of the code's passage in January, the city now has a bond fund of over $870,000. 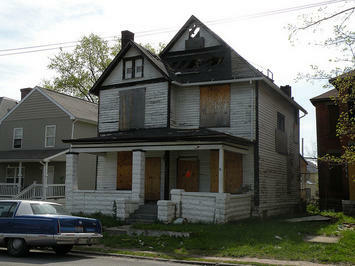 Youngstown can use the funds for upkeep of the vacant properties. The innovative move by a shrinking city to help keep neighborhoods livable may end up serving as a model for industrial cities across the nation that are faced with smaller populations and high foreclosure and vacancy rates. In Ohio, nearby Warren is now following a similar path. Because of the increased number of abandoned properties across the country, many cities are now seeing widespread demolitions. One result has been a vacant property movement by community organizations to build political pressure and stabilize neighborhoods, especially in shrinking cities. In the deindustrialized Youngstown-Warren area, vacant and foreclosed housing is now an MVOC priority. For MVOC Executive Director Heather McMahon, this was a no-brainer. "It's almost anti-American to say our city is shrinking. But with 62,000 residents living in a city built for 250,000, a declining tax base, and approximately 5,000 blighted vacant structures in need of demolition, we were in desperate need of serious, proactive remediation that addresses vacancy before it begins. If Youngstown is going to survive as a city and not go bankrupt like Detroit, we're going to have to figure something out." The MVOC developed a “listening campaign,” and started walking the neighborhoods to identify vacant properties. MVOC also began working with the Youngstown State University Center for Urban and Regional Studies to develop surveys and analyze and map results. The new data and new public involvement made visible how bad the situation had become. Since 2004, 5,186 properties have been foreclosed on in Youngstown. The community group also pressured Youngstown to hire a city official to oversee the largely independent and dysfunctional municipal departments concerned with vacant properties. It pushed the city to set up plans, timelines, and commitments for implementation of new legislation through a series of “public engagements” with a new mayor. To assure city accountability, it created a “Demolition Team” composed of local residents that demanded demolition contractors post start and stop dates at job sites. The transparency helped residents to understand demolition workflow and code enforcement more clearly. Because of these efforts, thousands of rental and vacant properties have been inspected and registered, a property maintenance appeals board has been created, and the city prosecutor has held appeal hearings. On a state level, vacant property campaigns have pressured the Ohio Attorney General Michael DeWine to develop Moving Ohio Forward, which established a demolition grant program to remove blighted residential structures. DeWine became the only Attorney General in the country to set aside funding ($75 million) from the banks’ robo-signing settlement for needed demolition in disinvested communities. Most recently, the MVOC is now trying to introduce statewide legislation that would protect neighbors who seek access to vacant properties without fear of trespass. It is also working with local legislators to introduce a new statewide homeowner’s Bill of Rights. Although neither of these initiatives will easily pass in the Republican-dominated Ohio legislature, they may end up providing a model for communities elsewhere. John Russo is a visiting research fellow at the Metropolitan Institute of Virginia Tech, a former co-director of the Center for Working-Class Studies, and professor (emeritus) in the Williamson College of Business Administration at Youngstown State University. He is a board member of the Mahoning Valley Organizing Collaborative (MVOC) (Youngstown-Warren), and the co-author, with Sherry Linkon, of Steeltown U.S.A.: Work and Memory in Youngstown. Flickr photo by Jinjian Liang of a vacant house near Columbus, Ohio. You Say You Want A (Metropolitan) Revolution?